Cloud sheets are like online spreadsheets that multiple users can collaborate on, scan directly into, pull information from, and update in real-time from their phone. Sharing the Cloud sheet with users. Then find it in the sheets overview on your device. Once inside the Cloud sheet, your scans and changes will be pushed and saved in it. Go ahead and give it a try. You can then add users with their Orca email accounts to your Cloud sheet. The columns are turned into entry fields so users can collect data on their phones, so think of the columns as fields in the mobile app. When adding the columns, check the App Preview on the right-hand side to see how it looks in the mobile app. 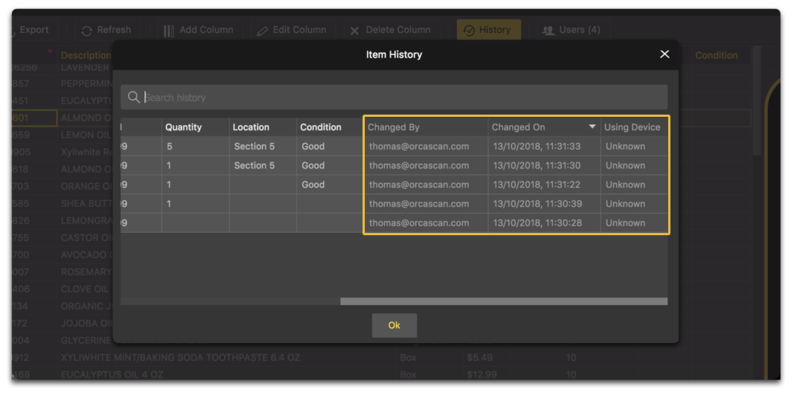 We can add new columns with types like date, text, quantity and more. You can also set rules like read-only or required to fill out. Here's the full column configuration guide. You might also import your item barcodes with descriptions, or min/max inventory level so users are surfaced the data in those fields and can update when received, shipped, transferred or inspected. In many cases, you will not want the users to modify the values that they pull down, like product descriptions or serial numbers. With the History log, all changes are traceable back to when, who, and what was changed. This is especially useful for producing audit trails or ensuring accountability.